2 What Happens to Someone with R.A.? 3 What Happens to Someone with R.A.? 4 Who Can Get R.A.? 5 Are there Complications from Rheumatoid Arthritis? 6 How Can the Doctor Tell if a Person has R.A.? 7 Is there a Cure for R.A.? 8 How Can People with R.A. Take Care of Themselves? Does someone in your family have rheumatoid arthritis? Would you like to understand a little more about this disease? Read on to find out all the facts! The most important thing to know about rheumatoid arthritis (RA) is that it is an autoimmune disease. Now, what exactly does that mean? It means that your body’s immune system — which keeps who healthy by killing off bacteria, viruses and other things that can get into your body and make you sick — can’t always tell the difference between those germs and your own body — and it starts to attack your body instead! In this case, the immune system attacks the synovium which is the lining which surrounds the joints (like your knees, fingers, shoulders, and hips). This is serious because it can eventually cause permanent joint damage! What Happens to Someone with R.A.? A feeling of being tired all the time called fatigue. At first, someone who has R.A. might notice the joint problems in the small joints in their fingers and toes. However, as time goes not, the problem with spread to other joints, including the wrists and shoulders in the arms and the hips and knees in the legs. These problems are not here all the time. There can be times, called remissions, where the symptoms are not there at all! There can also be times when the symptoms not only come back but get worse. These times are called exacerbations. It is common for people with R.A. to have periods of remission followed by periods of exacerbation. When the body’s immune system attacks the synovium of the joints, this can lead to the synovium becoming thick and tough because it is inflamed. When this happens, other important parts of the body, like the ligaments and tendons which hold the bones and joints together, can get weak and lose their shape and the way they hold together. This can change the shape of the joints. Sometimes, people with R.A. will have hands or feet that become deformed because of this process. This condition is thought to be caused by a genetic component, meaning that it is something a person is born with because they inherited from their mom or dad. However, sometimes people get R.A. who have no known family history of this disease. Anyone can get rheumatoid arthritis. However, the people who are most likely to get it are women between the ages of 40 and 60 who also have a family history of this disease. 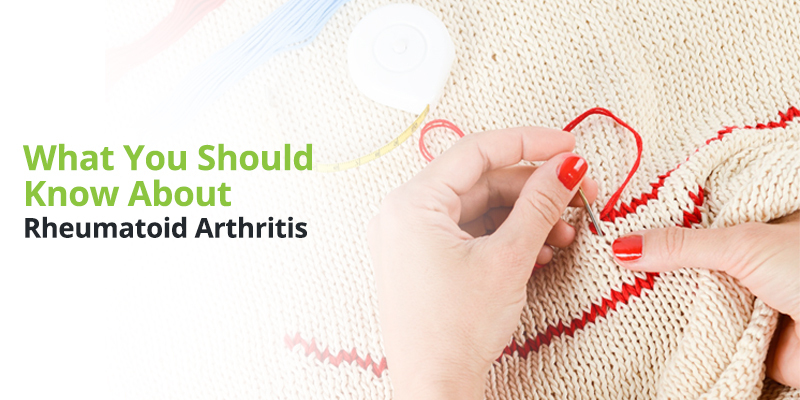 Are there Complications from Rheumatoid Arthritis? Carpal tunnel syndrome, a condition which affects the wrist and can cause numbness, pain and difficulty using the hands. It can happen if swelling from R.A. puts pressure on the nerves that help your hands move. Atherosclerosis. This is a condition where the arteries, the big blood vessels that bring blood to the heart, get hard or get filled up with cholesterol, which is a bit like wax. This can cut off circulation to the heart and cause a heart attack. Pericarditis. The heart is surrounded by a sort of thin sac called the pericardium (which literally means “around the heart”). Pericarditis is the inflammation of this sac, which can cause serious heart problems. Shortness of breath. This is caused by scar tissue building up in the lungs and can make it harder for people to get a good, deep breath. Osteoporosis. People who have osteoporosis have very weak bones, and this can make it easier for those bones to get broken. How Can the Doctor Tell if a Person has R.A.? In order to tell if a person has R.A., a doctor will do a physical exam, which means he will look over a person’s body and pay a lot of attention to the way their joints look and feel. He will also ask a person about what symptoms they have, such as if the pain or stiffness in the joints is worse in the morning. Erythrocyte sedimentation rate (ESR). This test measures how quickly red blood cells settle down to the bottom of a tube. If they settle very fast, this is a sign that a person could have R.A.
Rheumatoid factor. Some people who have R.A. have special components in their blood called rheumatoid antibodies. Doctors will do bloodwork to see if those antibodies are present. The doctor may also take X-rays. This allows him to look at the shape of the bones and joints to see if the R.A. has done any damage. Is there a Cure for R.A.? Unfortunately, there is no cure for R.A. However, there are treatments that can help someone with this disorder live a full and happy life. Medications like Advil or Aleve which someone can buy at the grocery store and which helps control pain and inflammation. Medications like steroids, which the doctor must give you and which can also bring down pain and swelling. Disease-modifying anti-rheumatics (wow, that’s a mouthful! ), which are medications that slow down R.A. (though they cannot stop it) and help protect the joints. Sometimes people will need to have surgery to repair tendons or joints. How Can People with R.A. Take Care of Themselves? In short, rheumatoid arthritis is an autoimmune disease which does damage to joints throughout the body, especially the smaller joints in the hands and feet. But while there is no known cure for R.A., it can be treated with medications and a healthy lifestyle to keep someone at their best!